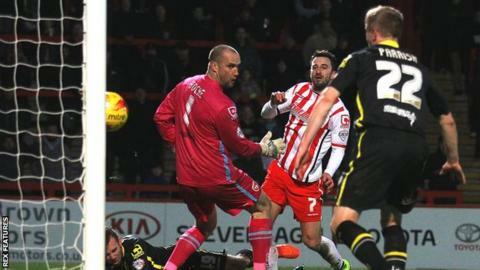 Chris Whelpdale's hat-trick helped Stevenage to victory despite a late Morecambe comeback at Broadhall Way. A Dean Wells shot put the hosts ahead, but Kevin Ellison's strike levelled the score before away keeper Barry Roche saved Ben Kennedy's spot-kick. Whelpdale's shot made it 2-1 before Alan Goodall conceded another penalty, which Roche saved from Whelpdale. After the break, Whelpdale completed his hat-trick but Paul Mullin scored from the spot and Ellison netted again. A remarkable game, which sees Stevenage move up to 18th in League Two thanks to their fifth league victory of the season saw Wells open the scoring with a powerful effort only for Ellison to restore parity with a half-volley. Roche then saved Kennedy's penalty after the Stevenage man was felled by Goodall. The hosts took the lead again when Whelpdale curled an effort in to the bottom corner before Goodall brought down Tom Pett, but Roche saved Whelpdale's effort from the spot. Whelpdale made amends when he curled home his second and he completed his hat-trick from close range to extend the hosts' lead to 4-1. But Morecambe, who are now just two points ahead of Stevenage, set up a tense finale. Mullin scored from the spot after Mark Hughes brought down Ellison, who notched Morecambe's third with a fine volley late on. "It was a very enjoyable game from our point of view. We've talked about playing the game for 50, 60 or 70 minutes. Today I think we got to 75 or maybe even 80. I wouldn't say we got lucky but we were fortunate there wasn't another five minutes after their third goal. "We scored some good goals and had opportunities to score more goals. I was delighted with how we played in the first half, it was probably our best 45 minutes. But like I said, 45 minutes does not win a game. "I was delighted with the way my players applied themselves today and how we went about the game. It's exactly what you want to do each week but it doesn't always happen like that." Match ends, Stevenage 4, Morecambe 3. Second Half ends, Stevenage 4, Morecambe 3. Goal! Stevenage 4, Morecambe 3. Kevin Ellison (Morecambe) left footed shot from the left side of the box to the bottom left corner. Charlie Lee (Stevenage) wins a free kick on the right wing. Hand ball by Tom Barkhuizen (Morecambe). Corner, Morecambe. Conceded by Dean Wells. Laurence Wilson (Morecambe) wins a free kick in the attacking half. Attempt missed. Anton Forrester (Morecambe) header from the centre of the box misses to the right. Attempt blocked. Mark Hughes (Stevenage) header from the right side of the box is blocked. Corner, Stevenage. Conceded by Shaun Beeley. Goal! Stevenage 4, Morecambe 2. Paul Mullin (Morecambe) converts the penalty with a right footed shot to the centre of the goal. Penalty conceded by Mark Hughes (Stevenage) after a foul in the penalty area. Substitution, Stevenage. Charlie Lee replaces Chris Whelpdale. Foul by Anton Forrester (Morecambe). Ronnie Henry (Stevenage) wins a free kick on the left wing. Substitution, Stevenage. Mark Hughes replaces Fraser Franks. Substitution, Morecambe. Anton Forrester replaces Shaun Miller. Corner, Morecambe. Conceded by Fraser Franks. Michael Tonge (Stevenage) wins a free kick on the left wing. Attempt missed. Lee Cox (Stevenage) right footed shot from outside the box misses to the right. Corner, Stevenage. Conceded by Andy Parrish. Peter Murphy (Morecambe) is shown the yellow card for a bad foul. Ben Kennedy (Stevenage) wins a free kick on the right wing. Foul by Peter Murphy (Morecambe). Ryan Edwards (Morecambe) wins a free kick in the attacking half. Goal! Stevenage 4, Morecambe 1. Chris Whelpdale (Stevenage) right footed shot from the right side of the six yard box to the centre of the goal. Dean Wells (Stevenage) wins a free kick on the right wing.